Use video to get your brand up in lights! Think movies for your audience’s screen of choice not advertising or promotion. With expanded ownership and use of mobile devices including smartphones and tablets, consumers can view as well as shoot video content when and where they wish. 36% of Internet users visit YouTube via a mobile device according to Global Web Internet. David Ogilvy would happy to know that video content supports sales, based on the following data about US adults from Animoto. 94% have watched a video in the last week. 58% believe that viewing a company video builds trust. 89% have shared an educational video. Further, in a world where B2B customers are at least 57% of the way through the purchase process before they contact you, it is critical to have video in your content marketing mix. 67% like how-to, instructional or tutorial branded videos. 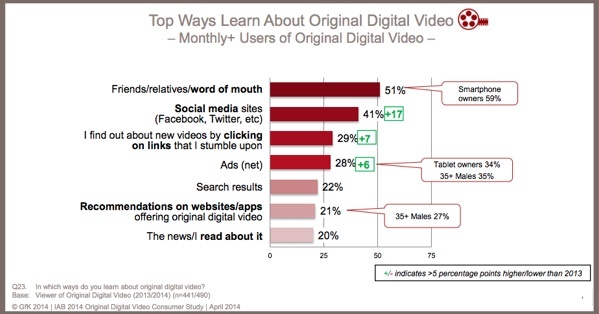 42% like comedy or spoof branded videos. 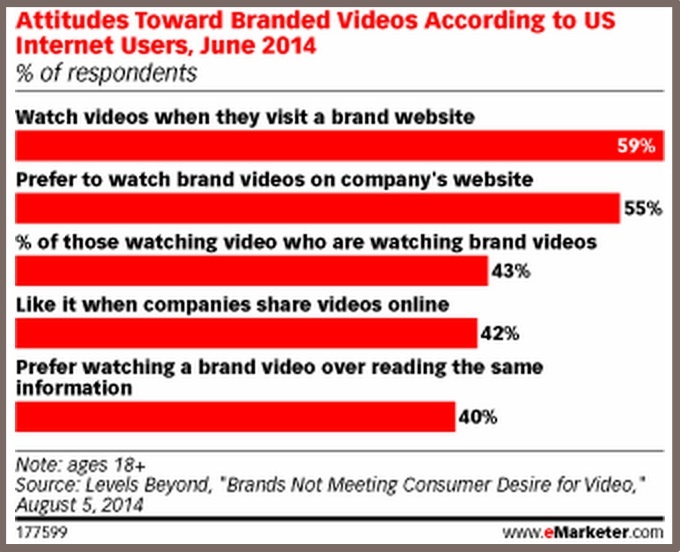 34% like product/informational branded videos. 33% like mini-documentaries branded videos about a person or event. 30% like animations or infographic branded videos. Unfortunately, many marketers opt for easy-to-create video content rather than what their audience wants. 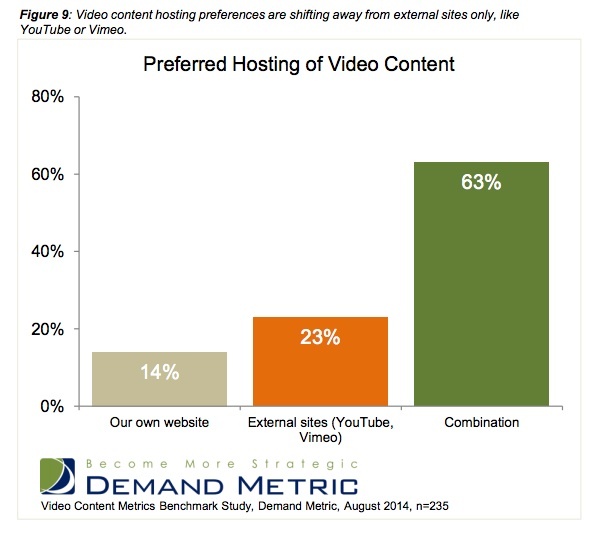 Generally, this video content is focused on the marketer’s needs, not the prospect’s interest! 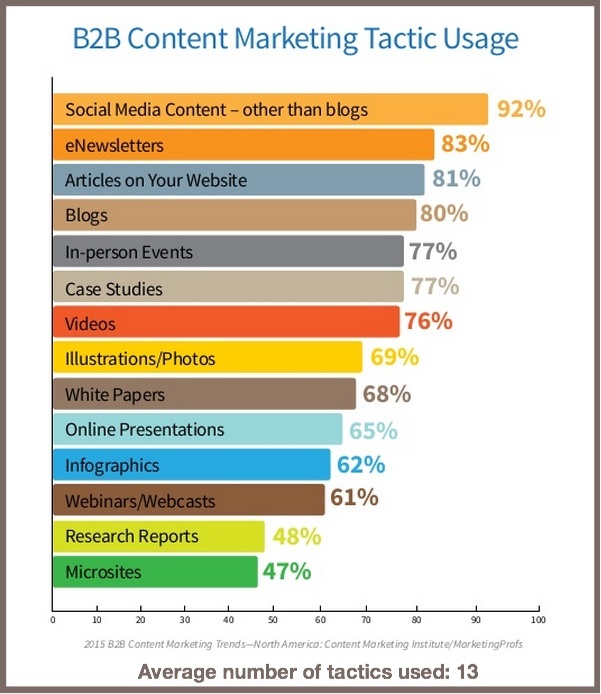 33% of marketers create event related content. 33% of marketers create how-to’s. 30% of marketers create interviews. 25% of marketers create testimonials. If you’re targeting a B2C market that consists of millennials, these video content trends are more extreme. 89.6% of millennials watch video via a smartphone and 76.8% watch via tablet, more than any other demographic group. Millennials watch more short-form content, specifically entertainment, news and user-generated content, according to a February 2014 Rhythm NewMedia study. 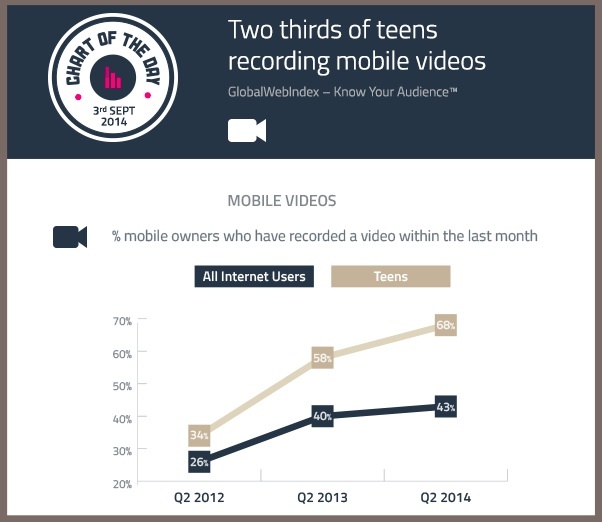 68% of teens recorded mobile videos within the last month according to Global Web Internet September 2014. Video content marketing should be part of your 2015 content plans because, it’s a major opportunity marketers are missing: Provide the video information your target audience wants. Don’t take my word for it. 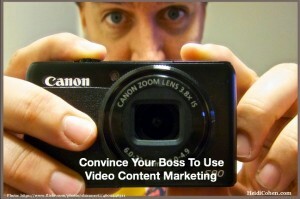 Here’s video content research to prove the point to your boss. In 2013, consumers viewed average of 210 minutes (or 3 ½ hours) a month of online video according to April 2014 IAB and GfK’s Original Digital Video Consumer Study. 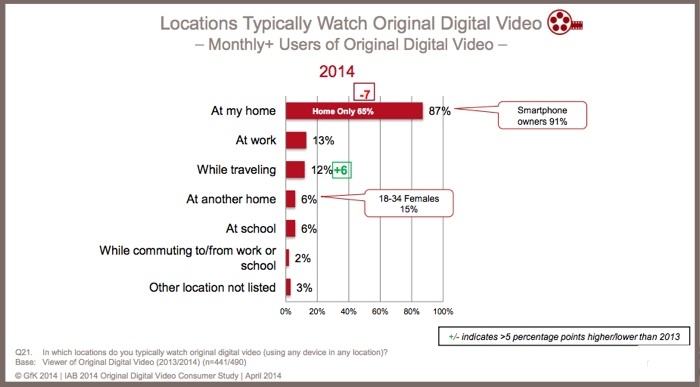 No surprise, like television, most online video is viewed at home. For B2B marketers, this means that you may need to persuade potential viewers to grab a set of headphones to listen without disturbing others! Help your target audience find your content. Unless you’ve got viral content, you must distribute your video content broadly to reach your target audience. While word of mouth and social media are the top reasons based on April 2014 IAB and GfK’s Original Digital Video Consumer Study, they aren’t effective for B2B content. Use all of your owned media sources such as your website and email. Write guest blog posts that incorporate your video. 47% of respondents cite brand awareness. 40% of respondents cite lead generation. 40% of respondents cite online engagement. 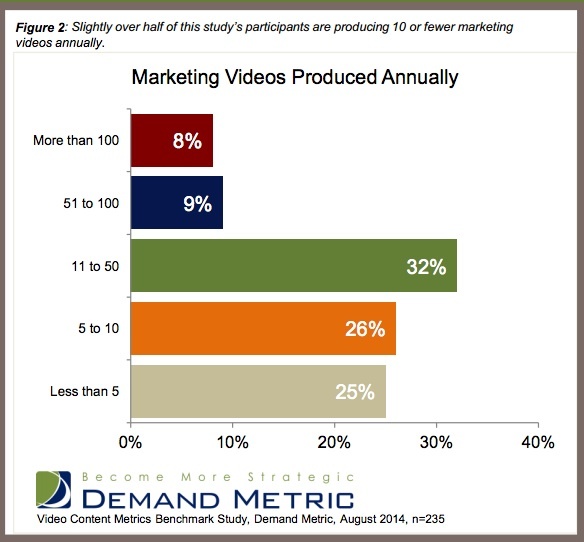 17% of those surveyed by Demand Metric create at least 1 or more videos per week on average. The average was 27 videos per year, roughly every other week. Use a combination of owned and third party sites to host videos. Rationale: Maximize reach. Only using your own site is insufficient to get broad viewership. 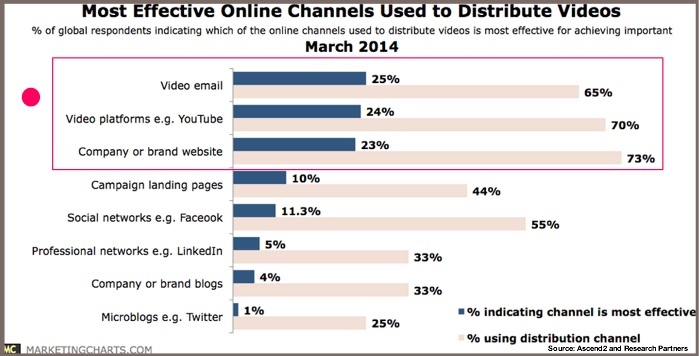 70% of respondents used video sharing sites. 65% of respondents used email. What’s surprising is that more marketers don’t use video and find it effective since BrightEdge research shows that videos are naturally compelling information format that attracts a 13% higher click through rate (CTR) than text. Video content unlike other content formats requires specialized skills, especially if you’re looking for more than a computer or smartphone video. As a result, marketers are opting to use a mix of internal and external resources according to the Demand Metric research. 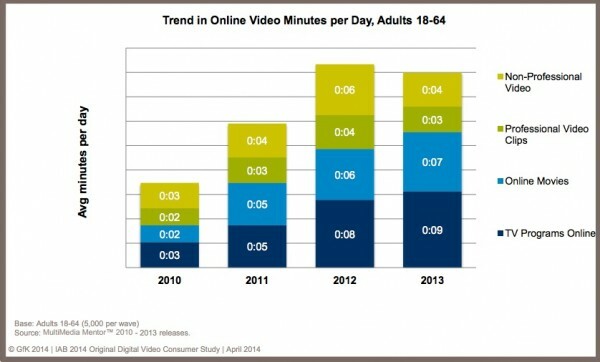 The bottom line is that video content marketing yields measurable results. “Video works at every stage of the buyer’s journey, from the awareness and consideration phases all the way down through driving leads and adoption,” said Cisco’s Mark Yolton. Specifically video content yielded 1,200 net new names and $13 million in sales-qualified leads last quarter. Since it’s difficult to make the case for video marketing content without any videos, here are 2 of my favorite B2B corporate videos. The second is an amazing example from 2005 created by Captains of Industry for Live Vault called, The Institute for Backup Trauma. Live Vault knew their geeky audience and appealed to them with John Cleese. By today’s standards, the video was long and garnered 150,000 downloads. 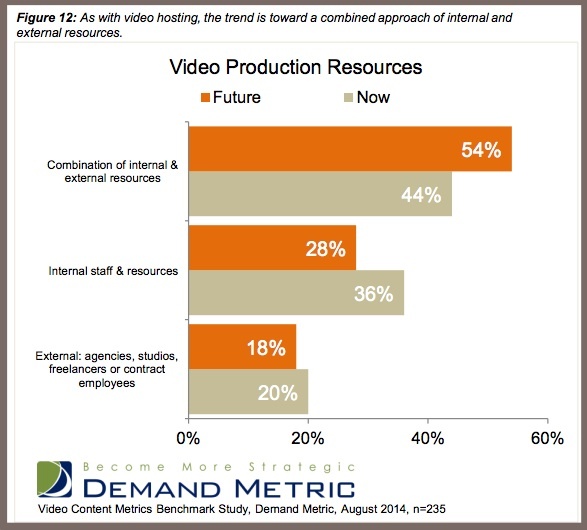 2015 is on track to be the breakout year for video content marketing. If these 11 video content research charts don’t convince your boss, then start testing using low cost tools. What has your video content marketing experience been? Tags eMarketer, GfK, Global Web Index, IAB, Video. Bookmark the permalink.